After so many seasons of slinking into skinnies, denim is doing a 180 with the flared leg. Huge for spring and still making a mark this fall, the flare leg is super flattering and versatile. As women, we are thicker in our thighs than we are from the knee down (try as you may, I fear this is just a function of our female anatomy:), hence flaring the leg out from the knee down balances out the silhouette and makes gams look longer and leaner! Some of my favorites are J Brand’s Lovestory $238, Free People’s Hi Rise 5 Pocket Flare $78 and McGuire’s Harlow Flare Stitch Pocket $227. Now while the 70’s are a huge trend for fall, you want to be careful to keep the rest of the look modern to avoid looking too costume-y. 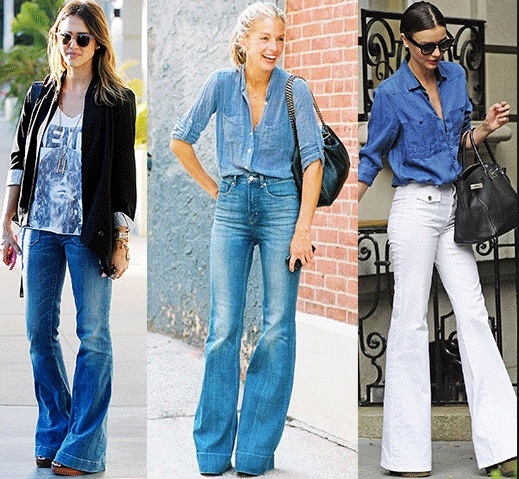 Try pairing your flares with a white blouse. A tie-front neck with lend itself to the 70’s trend, while a classic white blouse will make the look appear more tailored. I also love these jeans with a plain, semi sheer tank top and a ton of layered necklaces (click here for hints on layering). When the temperate drops, simply throw on fitted jacket /blazer and you’re set! The best, and by best, I mean cutest rain boots.